Step aboard the Pride of Africa: Since its establishment in 1989, Rovos Rail has earned an international reputation for its truly world class travel experiences. Step aboard the wood panelled coaches - classics remodelled and refurbished to mint condition - and enjoy fine cuisine in five-star luxury as some of the most varied scenery imaginable unfolds beyond the windows. Recapture the romance and atmosphere of a bygone era, when privileged travellers experienced the magic and mystery of Africa in a relaxed and elegant fashion.The trains - which may be hauled by steam, diesel or electric locomotives at various stages of the journey - carry a maximum of 72 passengers in 36 superbly appointed suites. Pride of place in the Rovos stable goes to the historic and newly rebuilt Capital Park Station and locomotive yard, which is the heart and new headquarters of this private railway company. World Class Comfort and Style: The rebuilt sleeper coaches contain the most spacious train suites in the world, offering every modern convenience and comfort. The epitome of luxury, with handsome wood panelling and period Edwardian features, the air-conditioned suites accommodate two people offering the option of twin or spacious double beds. All are equipped with a writing desk and, for valuables, a personal safe. There is also a bar fridge filled with beverages of the passengers’ choice and room service is available 24 hours a day. In the en suite bathrooms original fittings combine with the modern technology of hot showers, hair dryers and shaver plugs. 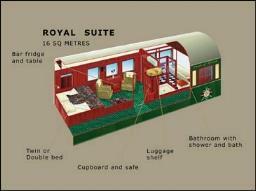 The Royal Suites, each of which take up half a carriage, are spacious and elegant, measuring 16 sq metres in size (172 sg ft). 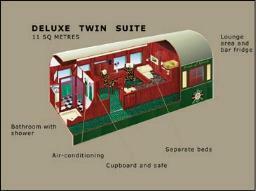 Each has its own private lounge area and full bathroom with Victorian bath and separate shower. The Deluxe suites (11 sq metres/118 sq feet) also accommodate two passengers in either twin or double beds and have a lounge area and en-suite bathroom with shower. 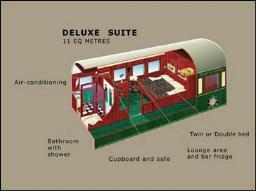 A third level of accommodation, the “Pullman” suite will be 7 square metres in size and while it will include the identical bathroom to that of the deluxe suites, the bedroom will be smaller with a one up one down bunk for twin requirements or a double bed for couples. During the day this can be converted into a comfortable couch. A Superb Collection of Restored Coaches: Rovos Rail operates two classic 20-coach, 72 berth trains as well as a third 13-coach, 42-berth Edwardian train which is available year round for charter. Each one of these carriages, from kitchen cars to sleeper coaches and guards vans, has its own story. A few dating back to 1911 were constructed in Europe and shipped to South Africa in the first half of the last century. Some carriages have carried royalty, while others have ended up serving as restaurants or lying derelict and forgotten on sidings for decades. These coaches have been collected from the far corners of the country and are now cherished members of the Rovos fleet of 75 carriages. The coaches have been painstakingly rebuilt and the use fine wood panelling, traditional furnishings and period décor has ensured an atmosphere of elegance and grandeur. Exquisite pillared dining cars are a signature of the Rovos Rail trains. Each one has a proud history and has been meticulously restored from a derelict state. For example Dining Car No 195 ‘ Shangani ‘, which was built in 1924, was found parked in a siding in Alberton near Johannesburg before its acquisition by Rohan Vos in 1986. Three of the magnificent teak pillars had been removed and these were faithfully crafted, restoring the Victorian atmosphere. Each of the trains has two 42-seater dining cars to accommodate the maximum complement of 72 passengers in total comfort at one sitting. Each train has a non-smoking Observation Car at the rear of the train, while the coach next to it contains a small smoking lounge. A unique feature of the Observation Cars is the enlarged windows and open-air balconies. At the centre of the train we have, when numbers dictate, a non-smoking Lounge Car, which houses the Gift Shop.